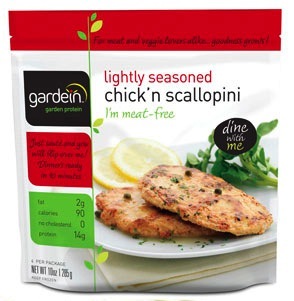 This week, something a little different: Gardein Chick'n Scallopini. I decided on a whim one evening to cook up a couple of these, dice them up, and bake them on a pizza. Then I fed it to my wife without telling her what it was, to see if she'd notice. I'll get to that in just a minute. To cook them, I tossed them into a skillet with a little oil and flipped them a few times until they were browned and hot. Because I was making a Greek pizza, I sprinkled some Greek seasoning onto them while they were cooking. Even though the website says they are seasoned, and I added additional seasoning, these were pretty bland. Not much flavor. I think it wouldn't hurt them if I went more aggressive with the seasoning. There wasn't any bad flavor, just not much flavor at all. The texture was a little weird. Very soft, but a little spongy, like a marshmallow. Not quite as soft as a marshmallow - maybe a stale marshmallow. But juicy. Anyway, it wasn't bad, just a little weird. I didn't really mind it, but it wasn't as chicken-y as other fake chicken products I've had. Once it took a pass through the oven on top of the pizza, it blended well with the other ingredients. I thought it might firm up with additional heating and/or drying out, but it stayed pretty much the same. It sort of disappeared on the pizza, in fact. When I asked my wife what she thought of the pizza, she identified the ingredient as chicken, but she said it wasn't very good. I told her it was fake meat, and she said she had thought it was a little weird. So there you go. If you try this product, I'd recommend a fairly aggressive flavor profile, because going light on the seasoning makes no difference. Okay, I just have to say that I've been vegan for a little over a year now and I learned that if you bake fake meats, they become "meatier" in texture. I usually eat Gardein products 4 to 6 times a month and absolutely love them. My meat eating step son eats them without any complaints. I also recently tried this product and mine was also sitting in the freezer from quit a while. I just followed the instructions for the scallopini recipe by lightly flouring them and quickly grilling the patty and then adding them to my sauce. The texture was the closest I've come to the real meat and the flavor was really good. I have to say these are now my favorite. I like all the Gardein products. I am sick and tired of killing animals.